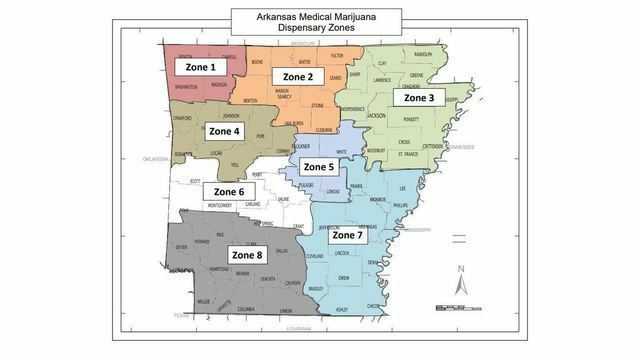 (KARK) - (1/10/19) The Arkansas Medical Marijuana Commission just approved the state's nearly 200 dispensary scores. It will officially award the licenses to the top 32 sellers in two weeks. The Arkansas Medical marijuana Commission unanimously approved the scores for the states nearly 200 dispensary applications Wednesday. In two weeks the commission will officialy award the licenses to the top four applicants in eight different zones. This clears the way for the health department to issue ID cards to patients in mid-February so they can go to Oklahoma and get a temporary license to buy the product. It seems everything is on track, but one unsuccessful applicant could derail it all. Baron Crane of New Leaf Cannabis Company says "Believe me, we've been waiting a long time. We don't want any more delays, but this needs to be done right and safely." New Leaf Cannabis Company applied in zones one and two, hoping for a license in Eureka Springs or Harrison but they didn't receive either. The company claims it found some of the consultants gave the same score in certain sections on most of the applications. Crane says "Wouldn't you want the safest applicants and the applicants with the best experience? This just means that they got overwhelmed and they started copying their scores down." The company filed a letter of protest Wednesday. When asked if the complaints could turn into a lawsuit, Crane replied "They very well could. Yes." However, the group hired to score the applications told the Commission it did quality assurance on them and did not find any skewed results. Travis Story of the Arkansas Medical Marijuana Commission said "I've probably been the most vocal critic of the process, but at the same time, I think they've done a good job." This isn't the only complaint that has been submitted. Another applicant stood up during the meeting and asked them to hold off on approving the scores until they addressed other concerns. Cultivators have told the commission they should have the product ready starting in April. Several companies scored in the top four in multiple zones. They will have to select one, and the 5th place group will get a license.